Whenever I think of the “The Princess Bride,” I remember the first swordfight between the Man in Black and Inigo Montoya. For all of the over-the-top action sequences and overzealous ham that compose the modern cinematic duel, the first swordfight evokes all of its intended emotions with little more than witty dialogue, some fancy choreography and stunts, and two foils. Director Rob Reiner knew what heartstrings to pull for every scene of the film; he concentrates on style over detail, which intrigues the human soul. It is a feature that stands the test of time and makes “The Princess Bride” worth watching, even on the date of its 30th anniversary. But perhaps younger viewers will not understand the sweetness behind such a classic. So, let me tell you a story. Once upon a time, the lovely country girl Buttercup (Robin Wright) falls in love with her handsome farm boy, Westley (Cary Elwes). Alas, their romance is cut short when Westley leaves the farm to seek his fortune, but he instead encounters the ruthless Dread Pirate Roberts at sea. Five years pass; fearing him dead, Buttercup despondently agrees to marry Prince Humperdinck of Florin (Chris Sarandon) for security. Months before their planned wedding date, a Sicilian oozing with a Napoleonic complex (Wallace Shawn), a Spanish fencer with a 20-year grudge (Mandy Patinkin), and a lovable giant (Andre the Giant) kidnap poor Buttercup with the intention of starting a war between Florin and Sicily; a mysterious pursuer clad in black soon gives chase. The narrative is an imaginative adventure that appeals to the lighthearted and childish, almost like a cliched fantasy novel. Which, it is. It’s actually a film about a kindly grandfather reading the above tale to his grandson, which is an adaptation of the real fantasy novel by the same name. 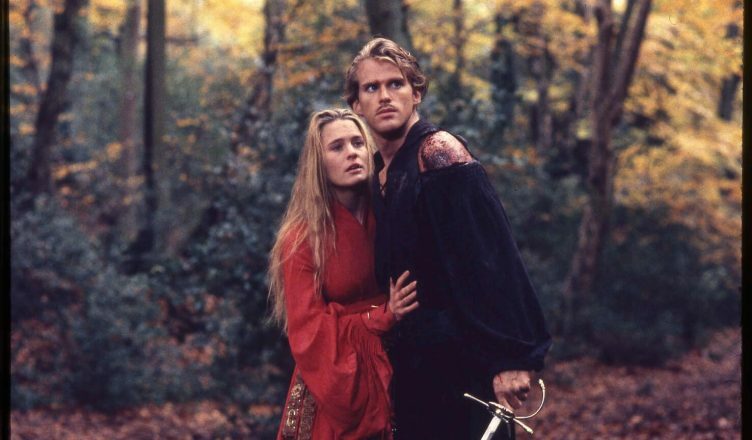 “The Princess Bride” is much more than a simple fantasy, however. It jovially parodies other fantasy films and novels of its generation, calling attention to often absurd narrative devices such as casual mid-combat conversation, decade-spanning revenge plots, and miraculous near-death recoveries that don’t account for medical limitations. Even the characters themselves appear aware of the farce that is their lives. The entire film is quotable; “… we’ll kill each other like civilized people!” says the Man in Black, and “I’ve got my country’s 500th anniversary to plan, my wedding to arrange, my wife to murder and Guilder to frame for it,” says Prince Humperdinck. It’s a wonder that the cast shot this film with straight faces at all. The film is not entirely satire. Though it mocks its parent genre, it also commemorates its finest aspects by adhering to the very features that it spoofs. Dialogue is acted out with a confident conviction attesting to the dreams, philosophies, and emotions of the actors and their characters. Again, it’s hard to pull such memorable catchphrases such as “Hello, my name is Inigo Montoya…” or “As you wish…” without a smile. Despite the limits of ‘80s SFX, production sets and the out-of-fashion synth music, the action and drama are carried out passionately. The body language in every swordfight and longing stare is always an assured posture. Mark Knopfler’s complementary score follows every motion to the letter, blaring in trumpets and high strings at precise times. Suddenly the fantasy is almost as real as one can believe. Rob Reiner and the original author William Goldman coordinated well to ensure that the final form of “The Princess Bride” was as authentic as possible to the original novel. To say that they succeeded is an understatement. “The Princess Bride” is now a classic, with an unforgettable cast immortalized in an extraordinary tale of romance. It reminds us to “feel” a little more than “think” and that the most spectacular tales sometimes come from the most basic formulas. To celebrate the 30th anniversary of “The Princess Bride,” Turner Classic Movies and Fathom Events is sponsoring its screening in theaters on October 15 and 17 across the country, including the local Edwards Mira Mesa Stadium 18 and the Mission Valley 20 theaters. Showings are available at both 2 p.m. and 7 p.m. To purchase tickets or get more information on future screenings, visit www.fathomevents.com.